Graham Nash is not someone I had ever planned to see in concert. I knew he was touring behind a new solo album (“This Path Tonight”) but that was it; I never bothered to check for a show nearby. 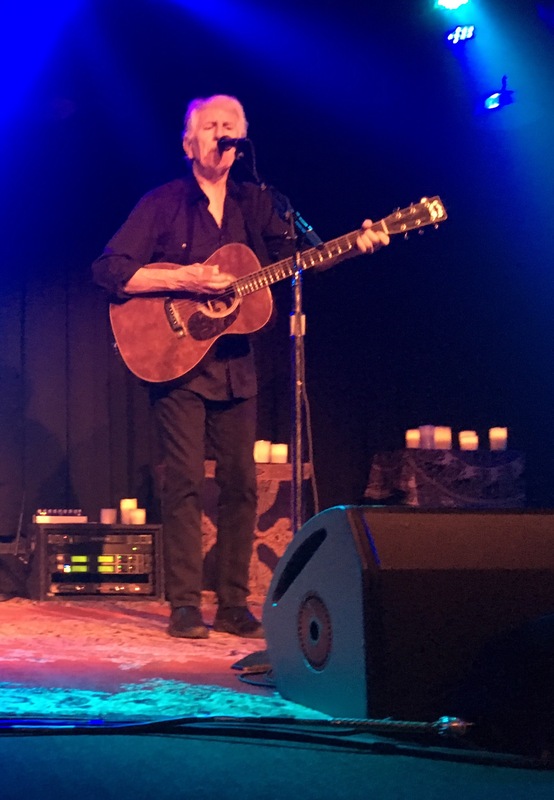 Last month Dana and I were at The Birchmere to see Al Stewart, and that’s where Dana found out that Nash was coming to The Birchmere on July 21. She insisted we go, and even though I knew very little of Nash’s work outside of his nearly fifty year collaboration with Crosby and Stills, I agreed, mainly because I’m always up for a show. The evening was all about Dana; she was the Superfan for this show, so whatever she wanted, she got. We arrived just as the doors were opening and then waited indoors for the General Admission seating to begin. On both previous trips to this venue, I’ve asked to be seated before the doors open, so as to avoid a mad rush. Since Dana was insistent on sitting “close”, and even though I was probably the youngest person in the building, I was more than happy to make the same request again. Only I didn’t have to. As the clock neared six, one of The Birchmere staff (Walter) came up beside Dana, pointed at me and told her “I’m taking him back [to the seating area] now, so follow me!” Suddenly I was being whisked to the back entrance, following two female VIPs, and taken to the main stage entrance. 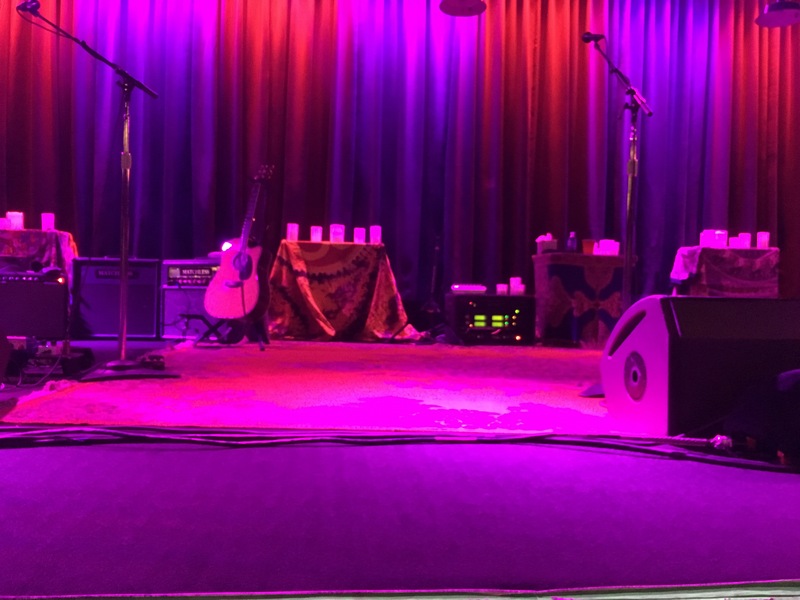 Normally when we attended shows at The Birchmere, Dana and I would sit in a booth in the second section of seats, about halfway between the stage and the back of the seating area. On this night, however, as we entered, I told Dana to “lead the way,” and she walked past our normal booth, and kept walking…closer and closer to the stage. She finally stopped when she arrived at a table at center stage and claimed the very first chair as her own. It was literally less than three feet from the front of the stage. I was still standing by our usual booth and saw where she was. Soon after we sat down, we were joined by three fans from Maryland: Vince, Leslie and Roz. We had a great time getting to know them over dinner (Another plus for The Birchmere: if you are there early like we were, you have enough time for a meal and dessert before the show begins.). How close were we? Dana was able to read the set list resting on the floor in front of Graham’s accompanying guitarist Shane Fontayne’s microphone. How close were we? Even when the house lights went down and the stage lights took effect, our seats were so close that Dana and I were bathed in light from the followspot (or spotlight). That marked a first for me. Graham walked onstage just after 7:30 and joked “Wasn’t I just here ten minutes ago?” Nash and Fontayne opened with “Military Madness” from his 1971 album “Songs for Beginners”, and followed with a set that included new songs from his latest effort, as well as pop classics he performed with The Hollies. Nash didn’t talk much between songs except for the occasional intro. The exception to this was a wonderfully hilarious explanation of the inspiration for the song “Cathedral”, which involved a Rolls Royce, an acid trip and a graveyard. It was moments like this that made the show so enjoyable for me, as someone not terribly familiar with his work, but someone who appreciates a good lyric and a great story. But, the reason the song became a hit is both because of the melody and the absolute sincerity in Nash’s vocal delivery. Say what you will about him (and lots has been said), the man means what he says and he believes it. Watching Dana watch the show was a lesson in fandom. As she admitted after the show, she ‘cried through the whole thing.’ (Direct quote). I was not aware that Graham Nash was able to induce that type of reaction, but it was fun to witness. Vince, Leslie and Roz are all members of the Bowie-Crofton (Md) Camera Club, (www.B-CCC.org) so Roz and Vince had “real” cameras and took some amazing pictures. 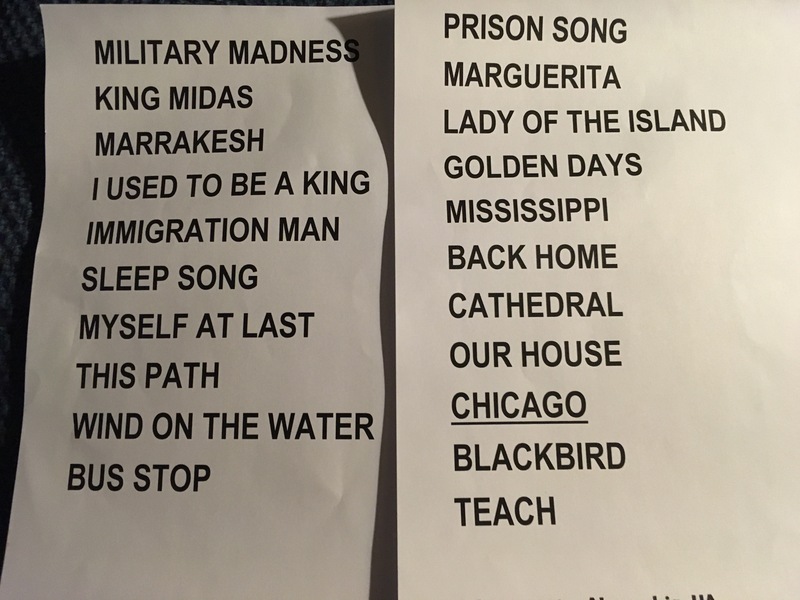 Also, at show’s end, Roz managed to snag the two page set list on stage in front of Shsne’s microphone. Graham Nash is still a singer and writer with something to say. He’s still a protest singer in the classic 1960s model, and these times need the voice of the protest singer, now more than ever. Thank you Dana for taking me to a show I would’ve missed out on had you not insisted on going. And thank you for the closest seats I’ll ever have for any show, ever. It was a fantastic experience.